Medical Displays for Less is now shipping Totoku's ME551i2 medical grade 5MP LCD, lowering the entry cost of single head mammography displays to less than $10,000. Market leading calibration software that automates quality control tasks is included. This time saving software performs the quality procedures that are necessary to meet the increasing requirements of PACS and high quality patient care. Minneapolis, MN (PRWEB) October 9, 2007 - The newest medical 5MP LCD display for mammography, Totoku's ME551i2, is now shipping from Medical Displays for Less. This is the first FDA cleared 5MP display with a list price under $10,000. Time saving calibration software is included that contains quality control procedures including those defined by the AAPM's Task Group 18. The Totoku ME551i2 is FDA 510(k) cleared as a "digital mammography LCD display." It is a 21.3-inch, 5 mega pixel, DICOM-calibrated diagnostic display with an 11.9-bit grayscale palette and 750cd/m² brightness. To realize a smoother and more precise grayscale display, the ME551i2 can simultaneously display 2048 shades of gray (11-bit). Accurately stabilizing luminance is a major diagnostic requirement of digital mammography. To address this requirement, Totoku designed a built-in, front mounted luminance sensor that constantly monitors and automatically adjusts the screen luminance. With the new software easy evaluation of DICOM GSDF conformance, based on the data measured by the sensor, is possible. Totoku's 5MP display goes through extra quality assurance because it is re-branded to major medical OEM's for use in their mammography workstations. Each panel must meet stringent defect pixel specifications that are the highest standards in the industry. The display is compatible with all PACS and digital mammography environments. The American Association of Physicists in Medicine (AAPM) Task Group 18 "is a national task force consisting of medical imaging experts and organizational affiliates dealing with performance evaluation of electronic display devices." Designed around the AAPM Task Group 18's guidelines, Totoku's latest calibration software saves the end user considerable time by automating these and other medically necessary calibration tasks. "The breast is uniquely structured and requires the highest spatial resolution and best low contrast detectable of any medical imaging modality. Mammography images must accurately display everything from very dense material, like calcium, to the other extreme of very low-density tissue. Thus, the highest-performance displays are required for filmless diagnosis. ME551i2 is the most cost effective solution for digital mammography because of its precise image presentation, quality control capabilities and low cost." Kevin Sundquist, Medical Displays for Less. Until recently, digital mammography displays have listed for up to $15,000 each causing dual head display workstations to be priced from $30,000 to $50,000 each. With the advances in manufacturing and computer technology, the same dual display workstation can now be sold for under $15,000. In addition to lower equipment costs, the ME551i2 reduces the time needed for quality control and calibration, which gives the end user more time to focus on the needs of the patient. Monitors Inc., DBA as Medical Displays for Less, is headquartered in health science and technology prominent Minneapolis, Minnesota. It is an ecommerce-based business selling medical imaging displays solutions LCD displays, workstations, and related technologies for use in the medical imaging and PACS community. Its principles are scientists, imaging system developers and administrators with lengthy operating and modality development experience in the industry. 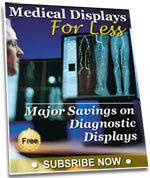 Monitors, Inc. announces the launch of their web enabled medical display division, MedicalDisplaysforLess.com. The site features a complete selection of EIZO and Totoku medical products. Medical Displays for Radiology, Cardiology, PACS and other medical imaging applications are now easier to find, buy and replace. Monitors, Inc. announces the launch of their web enabled medical display division Medicaldisplaysforless.com making them easier to find, buy and replace. Eizo and Totoku are featured on the site with a complete selection for Radiology, Cardiology, PACS and other medical imaging applications. Medicaldisplaysforless.com facilitates ease of access to high performance, medical grade displays for Mammography, MRI, CT, Digital Cardiology and other medical imaging applications. With 1000's of different displays in the medical use, finding and installing the medically correct monitor has been difficult until now. "The basis of the business is ready access to the most complete line of display products and ancillary services with medically knowledgeable support and sales staffing. This is what's expected in the medical industry today, where buyers are highly sophisticated and want it now, without compromise." - Brad Larsen, owner, MX Imaging, Mpls. MN. The product line is expanding to address the growing tele-radiology market and enable enhanced remote access to make physicians and paramedical persons more effective and efficient. Monitors Inc. is a privately held company with headquarters in Edina, Minnesota, (Minneapolis) doing business as Medical Displays for Less. The Company is in its 60th year of service to the medical imaging community. Interests will be further expanded to Medical Knowledge Management (MKM) and medically focused Wiki technologies for various applications in healthcare to be released this year. For further information please contact Charlie Minter, Business Development, Chalrie@medicaldisplayforlesss.com or call 866 369 1902.